A man made pond can be an attractive feature to add to your outdoor space and it can provide a tranquil setting. However, maintaining a pond does take some extra work to make sure the plants and fish are well cared for and that the pond looks great. The good news is that there are many great products on the market that can make taking care of your outdoor pond quick and easy. A major problem that some homeowners face is keeping unwanted pests out of their pond. There are many wildlife animals, such as birds, raccoons, and cats that would love to play in your pond. Unfortunately, this can destroy your plant life and kill your fish. Another common problem people face is keeping debris, such as leaves and sticks, out of their pond area, which can leave the pond looking dirty. An affordable solution that many pond owners find very effective is to use a pond cover over the water as an extra layer of protection. The most common type of pond covering used is a special netting cover. This netting is placed over type of the water or just below the water’s surface. It is anchored down with stakes, allowing it to provide a protective shield over the water. Leaves and other types of debris will not penetrate through the water, which make collecting and disposing of these debris quite simple. A popular option for gardens is the Hozelock mesh pond cover. Metal pond covers are also very popular. These covers come in all shapes and sizes and they can be customized to fit your specific pond. The metal frame will have slates or openings to allow you to see into the pond clearly, but it will keep out any type of wild animal. 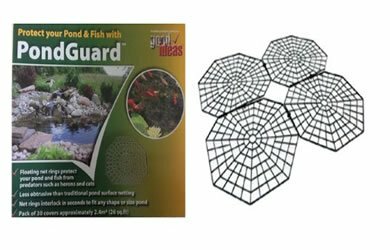 This will protect your plants and fish, while still providing a beautiful look for your outdoor space. The first thing you should consider when selecting the right pond cover is what the purpose for the cover is. If you simply want to keep out falling leaves and sticks, then pond netting will be sufficient. There are many types and quality of this netting available to allow you to select the type that best meets your specific needs. If, on the other hand, wild animals or your pets are getting into your pond, or if you have small children, a metal pond cover may be the best option for you. These covers are more durable and they will eliminate the risk of an unwanted pests or a small child from gaining entry into the pond. This will also keep your plants and fish safe. It is recommended that you use some type of pond cover for your pond. You should shop around to find a cover that best meets your specific needs. Be sure to measure your pond prior to looking for a pond cover to make sure you purchase the right size. Adding this extra feature to your manmade pond will definitely make maintaining the pond, your fish, and the plants easier. Copyright 2018 | Aquatics World | Affiliate Disclaimer.